Maybe I’ve been watching one too many episodes of No Reservations (scratch that, because it is simply not possible to watch too many times! ), but it seems like some of the best foods around the world are often the simplest. One thing that is so obvious yet so easily overlooked is the fact that people seem to live off of whatever is available to them…from the ground around them. Some of the simplest dressings for foods are citrus and herbs (fresh herbs that you could pick from your back yard). Convenience and availability are definitely a big deal for my busy life. 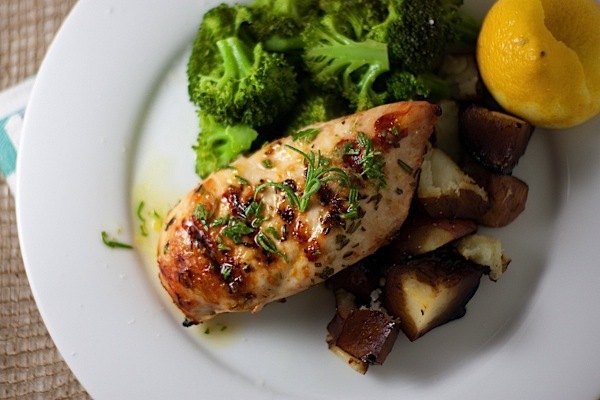 So the other day, with very little in my home for cooking, I whipped up a tasty 3 ingredient chicken dish – Quick Rosemary Lemon Grilled Chicken. At first, I was just going to season some chicken with salt and pepper, grill, and squeeze fresh lemon juice over the finished product, but when I remembered I had fresh rosemary growing outside, I decided to add that in for extra flavor. I decided to use half of the “sauce” to marinate the chicken for just a bit to try to get some lemony flavor on the chicken pre-cooking. Then, I used the last bit like I was squeezing fresh lemon juice over the chicken. Except, I whisked in the fresh, chopped rosemary along with some salt and pepper so you got a little extra zing. This easy, Quick Rosemary Lemon Grilled Chicken can be whipped up in no time. Using only 3 ingredients (and no oil! ), not counting salt and pepper, it’s one of the simplest meals you can make. 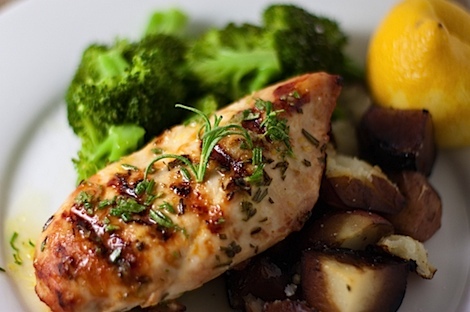 Whether you grill outside or inside, this oil-free chicken dish is sure to be a winner. Whisk together zest, juice, and rosemary in a small bowl. Divide into two portions. 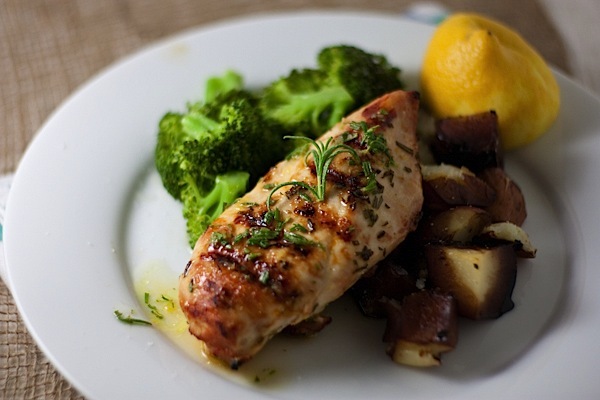 Use the first half of the lemon mixture to marinate the chicken breasts in a low bowl. Flip once. Marinate 15-20 minutes. Grill chicken, about 4-6 minutes per side, until chicken is cooked through, using any leftover lemon mixture to baste chicken as it grills. Note: This marinade will have touched raw chicken, so make sure you don’t use it the last couple minutes of cooking and cook all basted sides well. 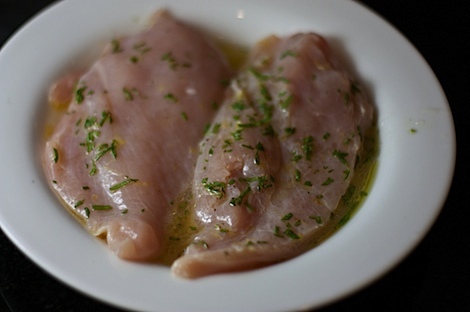 Serve chicken and pour reserved lemon mixture (the half that did not touch the raw chicken) over each chicken breast. Serve with grilled potatoes or rice, and your vegetable of choice (I went with steamed broccoli). Enjoy! 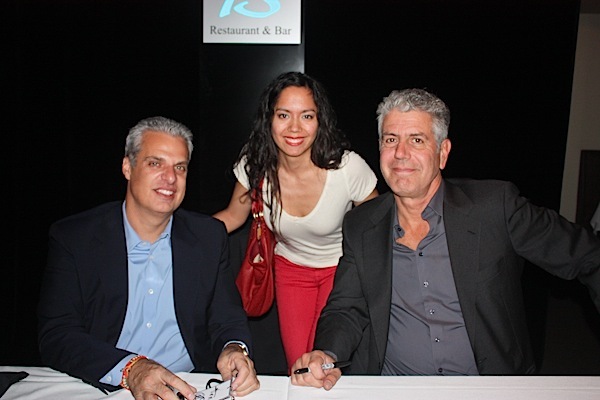 Oh, and speaking of No Reservations, guess who’s going to meet Anthony Bourdain in October? THIS GIRL! And I’m so excited! 🙂 Edit: Click here to view the post about when I met Anthony Bourdain and Eric Ripert. Also, I just registered for Foodbuzz Festival 2011, baby! Who else is going to Foodbuzz Fest this year? How do you decide what to cook? Do you prefer to plan in advance or do you like to use what you have on hand already? Oooh! I’m on a total rosemary kick lately! I had rosemary french toast on Sunday. This sounds great!! I love simplicity these days too. Gone are the days – at least for now – when I would enjoy hours in the kitchen. Currently it’s all about eating well without dwelling on it and enjoying it all the same. We loosely plan in advance, but mix things up as we go with what we feel like and always come up with something…. sometimes inspired, sometimes not so much! It ALWAYS goes better if I plan – getting home at 5:30 does not bode well for a timely dinner if I don’t have at least some idea in the morning of what I plan to make. Planning also allows me to pull things out of the freezer that need to thaw, and leave them in the fridge during the day. I aspire to be one of those folks who have the whole week planned out, based on what groceries and ingredients were on sale the week before. Wouldn’t that be nice? I wish I were that organized, too. But, you sound like you’re on the way to getting there! What are your favorite freezer meals to make in advance? I so want to go to Foodbuzz but I have no moolah to go! Bummer! I can’t decide if I should go to Foodbuzz or not! I love simple dishes like this. rosemary + lemon is really a great, fresh combo. I usually just see what’s in the fridge/pantry/freezer and put meals together that way. I know, I really need to plan better. I do do it some weeks. 🙂 Your recipes are the BEST!! !